"Woah! That's cool" Jiang was stunned for Taoxin is funny using her paws to comb herself. He can't help laughing at that. One thing is for sure. Its getting dark and we should go back to the palace immediately or the emperor might think his only daughter is missing. "Come on, Taoxin. Its getting dark. Let's go back to the wall." He said as he turned himself into a dragon again. "Oh, okay sure." Taoxin said, climbing on to his back. She'd miss the view though it was getting dark. Unknown to Jiang she quickly turned her eyes into those of a tiger's being able to see in the dark. She loved the view though and could help but wish to be able to stay longer, even just for a little bit. "Let's go back now." Jiang said as Taoxin got to his back and started rose above the sky. "We will come back again" He said as he tried to smile again. He chuckled of thinking that dragons can't smile or something in the face expression but a scary expression is always there. He traveled and noticed at the ground some little girls are went back to their houses and that's like Taoxin, she will now go home for its not a good thing for an emperor's daughter flying around in the middle of the night. As they flew above the great wall, almost landing, Taoxin saw the guards coming in. 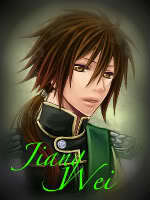 Their eyes were shocked at the sight of Jiang Wei but were scared nontheless. They held their weapons tightly pointing it at him. Taoxin laughed. As the were almost landing, but were still at a considerable height in the air, Taoxin jumped off feeling seriously free for the first time. The guards were shocked and Taoxin laughed landing on her two feet without a sound. "You scared us princess. It's best to report to your father quickly." They said in unity. And one took her arm leading her through the wall. She turned around and waved at Jiang Wei. "Bye Taoxin!" Jiang shouted as he continued to fly home.